Talking story with Sunny Garcia is always a tumultuous delight. Just like his power surfing, Sunny will cutback at you with the raw truth regardless of the question, while adding his own flare and experience to it. Sunny is the epitome of power, not just in surfing, but in life. Sunny powered through a rough childhood, incarceration, depression and professional surfing. He’s a Hawaiian World Champion of surfing, a Triple Crown legend many times over and today, he’s still charging Pipe and Waimea and is still a standout force ripping amongst the best of them. We sat down to pick his mind on his favorite power surfers, his favorite breaks to showcase his power surfing repertoire in Hawai’i, and why he likes Jordy Smith so much. Who are your top 5 power surfers? Dane Kealoha is my number one guy, just because to me and to a lot of guys my age when you think of powersurfing you think of Dane. Dane was the guy, even though we had guys like Barry and a lot of people before him. 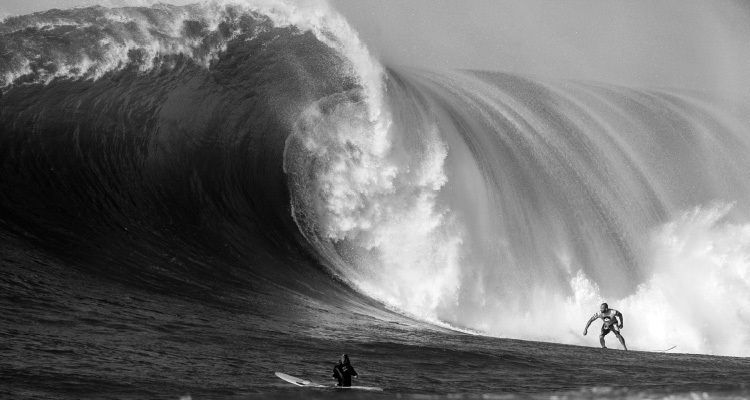 Dane was a modern day superhero at powersurfing that went on the the IPS tour back before the ASP and before the WSL. Dane was the guy and to me, he represented Hawai’i and everything Hawai’i was about. He was a very strong and very powerful surfer and everybody respected him for that. He will always be at the top of my list. Then Johnny Boy Gomes. He’s one of my favorite surfers, a good friend of mine since I was a kid. He’s all about blowing the back of a wave out, he would be my second choice. Then Tom Carroll, he was also known for his power, especially here in Hawai’i surfing Sunset and Pipeline and Haleiwa. Then I would have to say Mark Occhilupo, Occy. Coming from Oz, he is real powerful in small waves and pretty powerful in bigger stuff as well. My number 5 would be Pancho Sullivan because his layback hacks here at Pipe and Sunset and Haleiwa are pretty much second to none. Any disclaimer or words to those who don’t make your list? Not even a disclaimer. These are my favorite power surfers, if you don’t make it on the list I’m sorry. In fact, I’m not even sorry. These are my favorite surfers, it’s why I really wanted to push for this – it’s my list. Like I said, there’s a lot of guys who should be on this list. Kaimana Henry is a good friend of mine, I freaking love the way the guy surfs. If I’m going down my list…you guys don’t have enough room in the magazine for me to put my favorite power surfers. Kaimana, all the boys at the Volcom house… they would make the list, Tom Grom, Tai Vandyke, I sit with those guys every winter and we watch everybody do huge turns and we just all scream. Those guys for sure would be on the list, that’s all they do all day long. They get barreled, come out and do a huck. That’s the thing I love about being in Hawai’i. I walk across the street and go to Billabong house, the Quiksilver house, the Volcom house and we sit and watch everyone do huge turns all day long. Then again you have the grom scene at all the houses and they’re out there blowing waves trying to do airs and Pipeline…C’mon. I’m just honored to do something like this. For me, I watch all the events and I get to see some good powersurfing go down. Like I said Jordy, I watch his heats a lot because I like the way he surfs. I get frustrated watching some heats where guys are going down the line doing one huge air and getting thrown 9.5s. I think that’s freaking ridiculous to be getting those kinds of scores doing one turn. Why do you like Jordy Smith? Jordy is a big kid who does huge turns. He’s one of the new school guys that does airs but Jordy is 6’2”, 6’3” whatever 200 pounds and can surf 2 foot waves just as good as anybody and I’ve watched him terrorize Sunset as big as it gets. I like his style. He puts a lot into his turns. Have you seen this style of power surfing evolve since your early days? Back in the day, the boards were single fins. The nose was wide, the boards were thick. Those guys had a lot of board to turn and single fins don’t turn as quick or easy as a thruster. Now, the boards are thinner and have more rocker. They fit in the wave better, so everything went from raw power to fine tuned big long turns and hacks. It’s more fine tune but in the end it’s all about pushing. What about the top 3 places to power surf? I’d have to go with the Triple Crown spots: Haleiwa, Sunset and Pipeline. For my first, it would be Haleiwa. I would say Backdoor but my favorite wave to surf is Haleiwa. You get big walls to do huge carves and it barrels and even though there’s a lot of current you keep going round and round to get waves, it breaks in the same spot and for me that’s my favorite wave. Then Sunset, I like to go out when there’s big big sections to do big turns and then Pipeline, Backdoor and Pipe. If you like getting barreled and doing huge gouges, there’s no place better in the world to do that. You’ve said that it’s because of judging that power surfing has faded and that you believe airs are scored higher. I’m an advocate about power surfing, not to rag on the judging now or the kids, the airs are what’s new. That’s what they want. Everything goes in full circle and right now the hype is on airs and they want to do that and that’s the way it is. Will it come full circle, in your opinion? It always does. Progressive surfing comes in and then they go back to the basics which is power surfing and they go right back to the new thing. It all evens out in the end. Is there a missing element today, with the youth perhaps not knowing about such power guys that you’ve mentioned as your favorites? Like Dane and Barry? Not really. I never knew about the guys before Dane until later. I think the kids nowadays are getting the same thing, they’re a little more jaded because there’s a lot more surf events and they’re able to go and see all their favorite surfers. You can watch everything live. Maybe there’s a little disconnect because they get to see everything. When I was growing up, I couldn’t watch Dane in a contest unless I came out for the Triple Crown or 6 months later when the video came out and I’d watch him surfing from the events a year before. Now the kids are in tune, it’s good for them and it’s better for them because they get to watch their favorite surfers now.